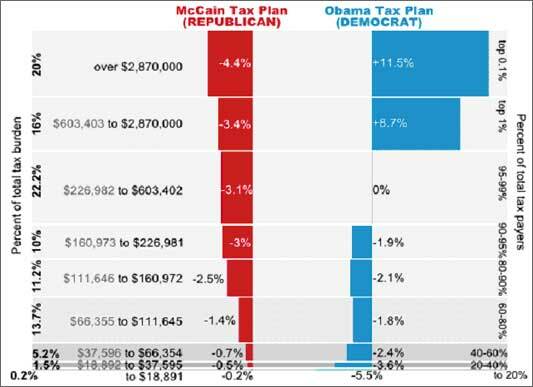 This compares Obama and McCain’s tax plans. It’s interesting to see this redrawn so that the bars are proportional to the fraction of taxpayers in each bracket — note that the wealthy (over $600,000 annual income), who benefit most from McCain’s cuts and lose most from Obama’s, represent less than 1 percent of the population. Note here that you can see where the money comes from for Obama’s plan; it’s close to revenue-neutral, as the rich pay a large proportion of total tax, and their tax hike pays for cuts for most everyone else. Since we all help to build the society that makes it possible for the rich to be rich, that’s fair enough, and they can best afford to spare it. McCain, on the other hand, gives the biggest cuts to those wealthy families, and winds up with a big drop in net tax income for the country. This will necessitate cuts in government programs, including ones that would benefit the lower and middle classes further. The depressing thing is to look at any of these graphs and realize that about 80% of families would be better off under Obama’s plan. If people vote their own interests — if they even vote the interests of the majority — then Obama should lead overwhelmingly in the polls. In fact, it’s more or less a tie. The book What’s the Matter with Kansas, by Thomas Frank, examined this phenomenon — that the middle class and much of the rural white lower class now vote Republican rather reliably, despite the obvious pro-corporate and pro-upper class policy bias of that party. Why? The Republicans have made a concerted effort ever since Reagan to ally themselves with social conservative views, although they’ve done little to enact policies that would further them. McCain used to honestly reject such pandering, but once he had a serious chance at getting nominated, he started cuddling up to the religious right, even to the extent of choosing Sarah Palin as VP candidate. I don’t think it’s all “values,” though, that causes people to vote for the Republicans against their own interests. I saw a study some time ago where people were asked what level of income they expected to achieve in their lifetime. 50% of the sample expected to be in the top 1% of earners before they checked out. This is the Republican party’s popular appeal in a nutshell. I’m going to win the lottery, I’m going to be a star NFL quarterback, I’m going to be CEO of a Fortune 500 company. And therefore, I don’t want the government raising taxes on the super-rich, because I intend to be one someday! The fact that 49% of that sample is doomed to be disappointed just doesn’t sink in. If you can’t admit you’re middle class, policies that favor the middle class won’t appeal to you. Update: Turns out that a lot of political scientists say that Frank’s thesis doesn’t hold up when you look at the data — the evidence indicates that the more money people have, the more likely they are to vote Republican. Doesn’t seem to be the case around here, but I have to say I haven’t collected data systematically. This entry was posted on Wednesday, September 17th, 2008 at 11:08 am	and is filed under Politics, Rants. You can follow any responses to this entry through the RSS 2.0 feed. You can leave a response, or trackback from your own site. I’m tempted to say “ah, the American dream”. It’s interesting to me that “class” is seen as mutable during a person’s lifetime – I guess this may be a major difference between British and American society. I could win the lottery tomorrow (if I ever bought a ticket) but I’d still be “middle-class”. On the other hand, there are people with the same sort of education and income as me who will proudly claim that they’re working-class, because it has a certain cachet. The truth is that British society doesn’t really go “working-class, lower-middle, upper-middle, upper-class” any more. It goes “long-term-unemployed, lower-middle, upper-middle, posh.” And the last two categories have nothing to do with income, and a lot more to do with perceived cultural assumptions. Things seem to be evening out a bit, with the result that unless they’re proudly working-class or deprived, practically everyone identifies as middle-class. Actually, I think polls show that the vast majority of Americans also identify themselves as middle-class, even though the range of incomes is huge. Still, class is generally perceived as synonymous with income level in the US, so that is a difference from Britain.